When the Twitter account of a prominent Yemeni political commentator and high-profile social media user fell silent on 14 August, it did not go unnoticed. Hisham Al-Omeisy is usually a prolific tweeter, known for his updates, in both English and Arabic, about the social and humanitarian crisis in his country. The 38-year-old has around 25,000 followers, among them many international media outlets, journalists and humanitarian workers who turn to him for insights about what's happening within Yemen. So when his account suddenly went quiet, those who have come to rely on him for valuable information, quickly knew something was wrong. Al-Omeisy has been critical of both sides of the war in Yemen. On one side of the conflict are the Houthi rebels, who are in control of the north. On the other is the President-in-exile Abdrabbuh Mansur Hadi, who is supported militarily by Saudi Arabia and eight other mostly Sunni Arab states. Aid agencies say the two-year war has created a humanitarian catastrophe. So what was it that resulted in Al-Omeisy's social media silence? His last tweet, on 13 August, the day before he was detained, spoke of "armed goons" turning up outside his door at his home in Sanaa. Image caption Hisham Al-Omeisy's last tweet before he was detained. A few hours after that tweet a close friend posted that Al-Omeisy was seen being taken away in a convoy of three cars full of armed people, in an area controlled by Houthi rebels. 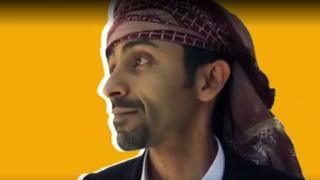 Both Human Rights Watch and Amnesty have issued statements calling on the Houthis to release him. In a statement to the Washington Post, Samah Hadid, Director of Amnesty International's advocacy campaigns in the Middle East, said, that Al-Omeisy's arrest was in violation of Yemen's laws. "Hisham Al-Omeisy has been detained without charge or a court appearance in breach of Yemen's constitution, which requires anybody arrested to be presented in court within 24 hours." Human Rights Watch also added that he had not been given access to a lawyer or allowed to be in touch with his family. Hisham Al-Omeisy also spoke to the BBC for a video in April called Guess My Country. Several thousand have used the hashtag #FreeHisham. Yemeni activists also told BBC Trending that Al-Omeisy's arrest has made them more cautious about what they say on social media. "There has been huge self-censorship after Hisham was arrested," Afrah Nasser, an independent freelance journalist and a human rights blogger based in Sweden, told BBC Trending, "It's very very scary actually because the more silenced people are, the less we know..."
Image caption Hisham Al-Omeisy's social media posts provided vital information from Yemen. BBC Trending also spoke to Wameedh Shakir, an activist based in Sanaa, who is vocal on Twitter. Despite some of the perceived dangers of being active online in her country, she remains defiant. "We are used to such practices and we keep going on." Indeed, Human Rights Watch says it has documented 66 cases of people arbitrarily detained or forcibly disappeared since 2015. Some Yemeni organisations say the numbers are much higher.